Preheat oven to 350 degrees F. Line 1 or 2 baking sheets (depends on size of biscuit cut) with parchment paper. Mix all ingredients, except water. Add only enough water to make a workable and rollable dough. Roll out to ⅛-1/4-inch thickness. Cut into desired shapes. Bake for 30-35 minutes. Turn off oven and let biscuits sit in oven until oven is completely cool. This helps to dehydrate the biscuits for better storage. 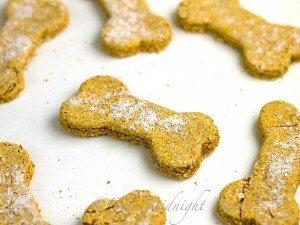 Makes about 3 dozen “medium” (about 3-inch long) dog biscuits.